Winona's all in one resource for insulation, attic insulation, injection foam, soundproofing, ice dam removal & prevention. Many homeowners are looking at improving their home's energy efficiency level, often through new insulation. As a leading insulation contractor, Ryan's is fully capable of handling any size project, big or small. We utilize blown-in insulation for attics. This special attic insulation called InsulSafe SP is manufactured by CertainTeed, and is great for improving your home's R-Value level. For Minnesota a R-Value of R49 to R60 is recommended for attics, and a R-Value of R30 to R60 is recommended for cathedral ceilings. All insulation projects we undertake are carried out by our full-time insulation crew. We have at least one BPI Certified installer assigned to every job, giving our customers the most professional and experienced installers. Often homeowners can save big on their insulation project, with state and federal programs giving incentives to homes who improve their energy efficiency level. Providing Winona with the best customer experience has always been at the center of what we do. If your taking bids from multiple insulation companies please give us a call. With over 30 years of experience in Winona and the surrounding area you won't go wrong when you hire Ryan's for your insulation needs. Ryan's is 2nd to none when it comes to soundproofing. Our specialized team can reduce noise levels through a variety of insulation products and procedures. Soundproofing is common for both residential and commercial buildings. Hear the difference today; call Ryan Insulation Winona's top soundproofing company! Over the past 3 years our company has been a popular call for homeowners looking at ice dam removal and prevention. We offer our ice dam services to Winona and the surrounding area. 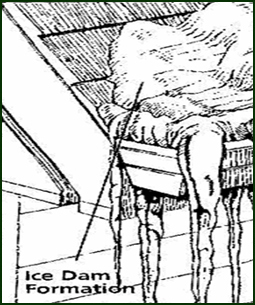 If your home is being affected by ice dams it could mean there's a problem with your insulation or ventilation. To pin point the problem give us a call or fill out our free estimate form below. Our professional energy experts will quickly diagnose the problem and offer practical solutions that are proven to work.